Want to take the Staging Diva courses live with me? I only take 15 students in the live courses. They're in a conference call format. All notes are emailed to you in advance and then you get a phone number and password to join me and your fellow students in the live calls on the five designated evenings. If you sign up now, you'll get in on the LAST live classes at the old price. Get the fall schedule and register before it's full. Of course you can always order course recordings so you aren't tied to the live class schedule. And, you get to listen to the material as often as you like! Being in your own business can be isolating at times. That's why I created the Staging Diva Network Online Discussion Group. It's for Staging Diva Graduates only and is a safe environment to ask questions, get support and feel part of a community facing many of the same challenges you are. It even includes a Live Chat feature in the monthly membership fee of only $20. Peggy, our Manager of Operations is absolutely fabulous. If you have any questions, please don't hesitate to email her. Sandy is my Executive Assistant who does a great job getting Graduation Certificates out to you in a timely fashion, keeping the Staging Diva Network humming, editing photos and putting together Directory listings and many other behind the scenes details. Feel free to email her when you need help! Peggy and Sandy will quickly handle your questions about registrations, certificates, course downloads, memberships and more. Don't worry, I'm still accessible but with over 500 emails a day, I need help! If you ask Peggy or Sandy something directly that they feel needs my attention, they always forward your message to me. I also review and edit (if required) all directory listings before they go live. Don't take home staging training just because you want "credentials" since there are none (not official ones at least). Anyone can call themselves a professional home stager, there are no requirements or licenses to do so. The only real reason to take a course is if you feel the content will improve your chance of success. Consider your own strengths and weaknesses. Decide exactly what you need to get out of a program and then find training that offers that. Look for a trainer that has a proven track record of success in whatever they're going to teach you. Otherwise, what proof is there that their methods work in the real world? Look for evidence that there's a genuine interest in sharing real information with you and providing ongoing support for your growth. If it's all about "selling a course" then don't expect anything else once you're a paying student. I also recommend you check out comments from real people who have taken the program. If student testimonials have no names, no photos and no way to locate them, how do you know their comments are real? No single training program will be right for everyone! You owe it to yourself to research your options and choose wisely, based on your specific needs. You are receiving this newsletter because you expressed interest in learning about the business of Home Staging. If you don't want to continue, use the "Preferences" link at the very bottom of this email. The fall real estate season is in full swing and with it the inevitable crush of seeing kids settled into school, scheduling new activities, etc. Even though it's been many years since I went to school, September always feels like a new year to me and it's when I've launched all my businesses. Would it surprise you to learn that five years ago, I hadn't staged my first client's home yet? Back then I could have talked myself right out of being a stager if I focused on the fact that I had no formal interior design training. I had no mentors and no template to follow when I started Six Elements Inc. Home Staging, yet I've staged hundreds of homes and become an internationally recognized expert. If fear had held me back, none of this would have happened. There are now over 600 Staging Diva Graduates worldwide who have learned from my experience of growing a successful staging company and who have a blueprint to follow. I'm continuing to do minor renovations and decorate my new house-- a great opportunity to test new painters, handymen and electricians for my staging business. No matter how long you've been at this, it's always a challenge finding reliable trades people. So when you do, guard your resources so they'll be available to your clients when you need them! I did a live radio show in September for the Radio Colorado Network, which covers most of the state. Guess what the interviewer's first question was? "How come you don't have any stagers in Colorado listed in the Staging Diva Directory of Home Stagers?" I hope you find the content of this issue of Staging Diva Dispatch helpful. I welcome your feedback and/or new story ideas! SPECIAL ANNOUNCEMENT - The cost of the Staging Diva Home Staging Training Program is going up November 14, 2007. If you want to s.av.e $100, now is the time to order. You may want to suggest a teenager bedroom (even if there aren't really any teens living in the house). Don't fall into the trap of assuming "neutral" means bland. You can create a striking and appealing environment with color and a few accessories as seen at right, before and after. In the bedroom of this modern home, the wall color is Benjamin Moore's "Carmel Apple (CC-450)" in Canada and "Edgewood Rocks (1056)" in the US. The color is a warm complement to the deep brown-stained floors and brings out one of the colors in the new duvet cover. If you need help choosing colors, check out the "Staging Diva Ultimate Color Guide: the easy way to pick colors for home staging projects." The Guide is written with both US and Canadian colors. It's really frustrating to see new and aspiring stagers sabotage their success. Sometimes it's due to a lack of knowledge (that can be fixed once you know what to do) and other times it's because of a lack of focus. Some stagers wonder why they don't have the business they want when important basics aren't covered and they are actually making it DIFFICULT for people to hire them. The stager has no voice mail, so when a prospective client calls they are likely to hear an endlessly ringing phone or a busy signal. They'll never call back and the stager is left wondering why they aren't getting calls with new projects. The stager doesn't have a professional outgoing voice mail message, or babysitters and young children answer their "business" phone. This is one of the quickest ways to turn off a prospective client. They won't leave a message and you'll never know what projects you missed. The stager sends an email from an unprofessional sounding email address with an obscure or blank subject line. The recipient may not even open the email because of the 'from' address or subject line. The decision is made in a split second, so consider these carefully when sending work-related emails. The stager's email doesn't include a professional signature. At minimum, signature files should include: your name, email, phone, company name and a link to somewhere they can go to see your portfolio online. Few people will take the time to look up your number to call you. Give it to them, make it easy! Also, you never know where your email will be forwarded, so it's important to include all this information. The stager is a full-time Mom with no childcare arrangements. This may sound harsh, but honestly if there's no one else to look after your kids, how are you going to grow a business? I raised my daughter entirely on my own while being self-employed, so I understand the "catch 22" of this situation. If you are planning to grow a business, then you need to invest in childcare whether you need it yet or not. Deciding how much or how often is up to you, but there have to be reliable windows of time that you are available to potential clients. 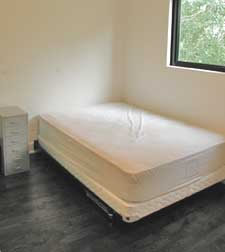 The stager doesn't have a website or a listing in the Directory of Home Stagers because they don't have a portfolio. Getting a minimum of three pairs of before and after photos should be one of your top priorities because no one will hire you without them. What rooms can you take apart or redesign in your own house, a friend's or relatives? Maybe your neighbor has always wondered what to do with the family room. Think about it, you only need three different rooms. Are you going to let that stand in your way of starting your business? The stager doesn't follow up on a business lead within 24 hours. Ideally, you should follow up within 8 hours, after 24 you won't seem interested. More ideas like these are covered in "10 Low Budget Ways to Grow your Business," which is part of Staging Diva Course 2, The Business of Home Staging: What you need to start and grow. Serving Morristown, Talbott, Dandridge, Jefferson City, and Knoxville Tennessee. Serving southwestern Idaho's Boise, Meridian, Nampa, Caldwell, and Mountain Home. Serving Barrie, Innisfill, Midhurst, Shanty Bay, and Springwater Ontario. Serving Vancouver, West Vancouver, North Vancouver, Squamish, and Whistler British Columbia. Serving Hamilton, Ancaster, Brantford, Dundas and Guelph Ontario. Serving Jefferson City, Columbia, Holts Summit, Ashland, and Fulton Missouri. Did you know that when you join the Staging Diva Directory of Home Stagers, you can pick any five locations to be linked from on the main page? If you're the first to pick those locations, you'll always be listed first. If there is more than one stager in a city, they are listed on an "intermediate" page for that city (in the order in which they joined the Directory) and from there the links go directly to their Portfolio page within the Directory. Here's an example of an intermediate page I created for Washington DC. Congratulations to Sveta Melchuk, Home Staging Montreal, who turned a client referral I gave her into a $7,000 project, which yielded an awesome client testimonial when the house sold in 3 weeks for over $80,000 more than expected. And the client's agent was so pleased she now uses Sveta as her stager. Congratulations to Joanne Adamenko, Dramatic Transformations, who joined the Staging Diva Directory in August and got her first staging project within a month of that! Congratulations to Staging Diva Graduate Jodi Whalen of Pear Tree Home Designs, LLC who was able to quit her cable network job and follow her passion for decorating and home renovations. Using what she learned in the Staging Diva Training Program, she already had two clients before completing the 5th course. Congratulations to Michele Hess of Simply Staged (IL) who has been featured widely in the local paper. This shot of Michele in action is from an article on Rockford's Parade of Homes. Talk about building a profile with the local community! This weekend event is for the Home Builders Association of the Greater Rockford Area and is well publicized and attended. Michele will also be featured in the next issue of Rockford Woman Magazine. That's the way to "splash on the scene" as I discussed in course 4 of the Staging Diva Training Program. I did a radio interview with Joe White for Radio Colorado Network in September. We discussed the impact home staging can have on the selling price of a home, and how long it takes to sell and why it's hard for homeowners to do it themselves. He asked how listeners could find a home stager and I invited them to use the Staging Diva Home Stager Locator Service. Colorado Graduates, please note that if you were listed in the Directory of Home Stagers, it would have been you on the radio not me. Joe White's first question at the top of the show was, "why don't you have any stagers in your Staging Diva Directory in Colorado?" Learn how you can join the directory so the media can find you for their next story and homeowners and agents can find you when they need a stager. circulation month for the magazine! 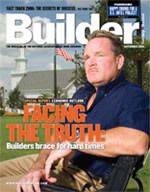 Builder Magazine interviewed me for a story about how staging offers home builders a cost-effective alternative to the purchase incentives they're using to attract buyers in a slow market. Those incentives currently include car leases, buy-backs, d1scounts and more. I'm excited about this story as it will help all home stagers market their services to the residential building industry. This magazine is not only the LARGEST TRADE MAGAZINE in the United States, in August 2007 it was named "Magazine of the Year" in the 80,000+ circulation category, beating out publications like BusinessWeek and PC World. 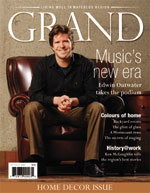 Grand Magazine did a feature on Home Staging for their Home Decor Issue in September. Congratulations to Staging Diva Graduate Colleen Ernewein, Home Impressions Staging and Decorating, for being one of the 5 featured stagers. The editor contacted me to provide before and after shots for the story since they didn't want to appear to favor one local stager over another. The editorial line up was changed so I'm still waiting for the publishing date for the home staging story I was interviewed for in Better Homes and Gardens-- a 38 million circulation magazine! This continued media attention generates business leads for Staging Diva Graduates. For less than the cost of an evening out (or a Yellow Pages ad), you can be part of the Staging Diva Directory of Home Stagers! Once we build your profile page for you (you don't need to know anything about websites), I "host" your information on the Staging Diva Directory of Home Stagers for only $45/month. You'll be advertising your business 24 hours a day, 7 days a week on a site that I work on getting visitors and media to, so you don't have to! If you're a Graduate of the Staging Diva Program, I don't know what you're waiting for! More information on how it works and how to get listed in the Directory. A growing number of reporters are grabbing their stories right off my websites without even interviewing me. If any of you see me in a local paper or magazine, I'd be happy to send you a thank you gift in exchange for a copy of the story! I'm re-running this story because I still get the same inquiries about how the referral system works. A homeowner or agent contacts me because they want a stager. We direct them first to The Staging Diva Directory of Home Stagers and if they can't find someone there, they're invited to complete a form at the Staging Diva Home Stager Locator Service. If the client finds a stager on their own through a listing in the Staging Diva Directory of Home Stagers, there's NO referral fee charged to the stager. If the client fills out the form using the Locator service, I post an article on The Business of Home Staging advertising the project. If a stager wants to apply, they use the link in the story that takes them to the Home Stager Project Referral Service. Stagers who apply and complete all the information requested are recommended to the client after I've seen their website/portfolio. It's then up to the client and stager to follow up with each other. If the stager gets work, I collect a referral fee. If they don't get work, I've invested considerable time and effort and the stager has gained experience dealing with a potential client at no cost to themselves. Who can participate in the Staging Project Referral Service? have either their own website OR a profile page on the Staging Diva Directory of Home Stagers. Otherwise, they are unlikely to win the project (because they won't appear professional/established to the client) so why should I spend my time and risk my reputation recommending them? Please don't apply for projects unless you meet the criteria indicated above. We will not accept emails of brochures or portfolio photos as a replacement for having a professional looking website or profile page on the Staging Diva Directory of Home Stagers. If I've sent projects your way and you haven't let Sandy know what happened, you won't continue to receive referrals. Even though I've been staging homes for a long time and I'm well known, not everyone who calls me to discuss their project actually hires me. This is a reality of the business and one that you can't take personally (though this is sometimes hard, especially when the prospect sounds so interested at first). some stagers do inadequate follow-up preferring to wait passively for the client to contact them. Meanwhile the client assumes the stager isn't really interested or available. I hope this clears up some of the misconceptions about this program. If anyone has suggestions for how it can be improved, I'd love to hear from you. 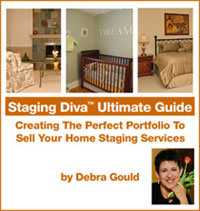 Learn more about joining the Staging Diva Directory so clients can find you on their own and you avoid referral fees!